Nice red dog poker working place. 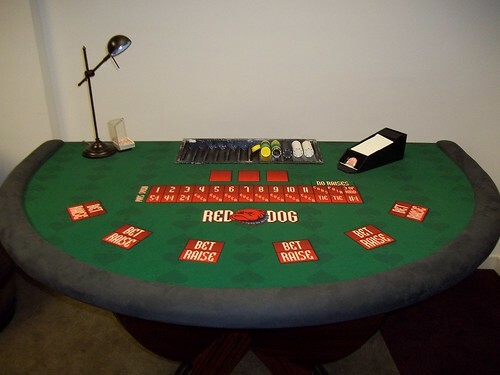 A card game Red Dog is similar to the game, "Between the Sheets” which is played on a table equal to the size of the blackjack table with two spots of betting i.e. the "bet" and the ‘raise’ along with using 2 to 6 decks containing 52 playing cards. On each hand only three cards are played from the irrelevant card suit. The game is so simple, hence so popular too. An opening bet is placed by a player as well as two cards are dealt by the dealer. The aim of the game includes the probability of betting on the ranking of third card to be falling between the initial two. If it happens, the player wins if not he/she loses. It is very simple so far. Then, comes in the ‘raise’ bet and it depends upon the "spread". Spread includes the figures of card values lying between the two original cards. The value constituted by any card from 2-10 at face value, 11 is counted for a jack, 12 for a queen, 13 for a king and 14 for an ace. For example, suppose a 7 and a 10 is dealt by the dealer. What will be the spread? Since, 7 and 10 involves 8 and 9 in between, the spread will be 2. No spread will be there between the consecutive cards, like 4 and 5, the spread will be 0. That will be referred as a ‘tie’, The hand will be completed and the money will remain kept by the player. To bet on the spread can be regarded as the interesting part of the Red Dog game. This would be referred as an optional 2nd bet where a player can go for a bonus payout. The odds are set by the casino house depending upon a simple principle: the payout potentials of the payout will be higher as per the narrowness of the spread. After the opening of the bet, the cards are placed on the table in facing up position and a marker will be placed by the dealer indicating the difference between the spread and the odds offered by the house on an extra bet i.e. the raise. If no further bets are placed, the original bet will be won by the player at even money if he/she wins the hand. If the player opts for raising, he/she will be betting at the house odds as printed on the table of Red Dog. If a player wins, he/she will be getting his/her original bet at even money along with the raise bet at the indicated odds. If there becomes a tie between the initial two consecutive cards, the player will keep his bet. If there will be a pair constituted in the two cards, the betting gets stops, but the player will get paid at the ratio of 11:1, if there made a three of a kind with the third card. Otherwise, the bet of the player will get lost. Finally, there becomes a match between the third card with any of the initial two cards, the player will have lost.